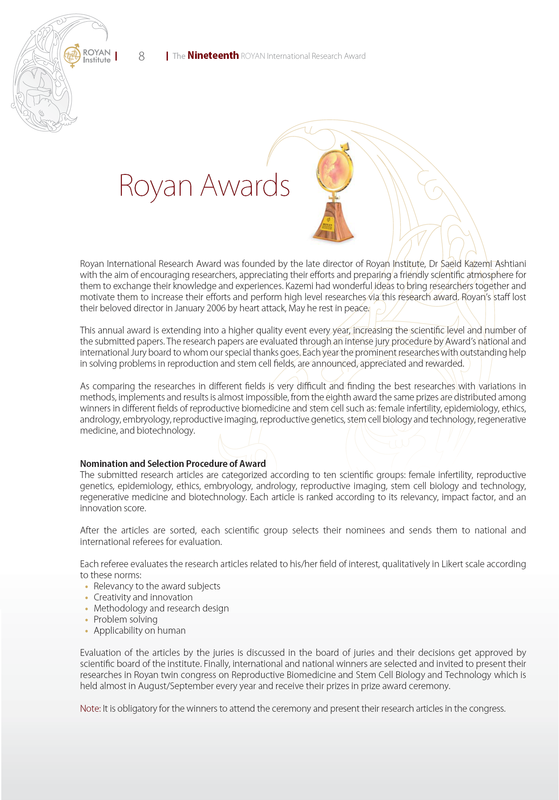 Royan International Research Award was founded by the late director of Royan Institute, Dr Saeid Kazemi Ashtiani, with the aim of encouraging researchers, appreciating their efforts and preparing a friendly scientific atmosphere for them to exchange their knowledge and experiences. Royan International Research Award (RIRA) is an annual prize, established in 1999, geared toward researchers in stem cell biology and technology sciences, regenerative medicine and reproductive biomedicine. The prize is awarded for outstanding basic or clinical research in related fields performed by the applicant. Royan Institute is going to hold the 20th RIRA with the aim of encouraging researchers, appreciating their efforts and preparing a friendly scientific atmosphere for them to exchange their knowledge and experiences. The submitted research projects are evaluated through an intense jury procedure by Award’s national and international Jury board. Each year the prominent researches with outstanding help in solving problems in stem cells, regenerative medicine and reproduction fields are announced, appreciated and rewarded. Each winner will be rewarded with a certificate, the symbol of Royan Award and a Prestigious Iranian Board Rug.